Salesforce Standard Forecasts And Customizable Forecasts Overview - Kloudrac Softwares Pvt. Ltd.
A forecast is your best estimate of how much revenue you can generate in a quarter. This amount is divided between Commit Amount – the amount you can confidently close – and Best Case Amount – the total amount of revenue you might possibly generate. A manager’s forecast should include the amount of revenue the entire team can generate together. The Forecasts tab also displays your monthly revenue projections, the amount of open opportunities in your pipeline, and the amount of your closed/won opportunities. Managers’ forecasts also show a roll-up of forecast data for users that report to them. Customizable forecasting is a flexible solution for estimating how much revenue your organization can generate or how many items your organization can sell. 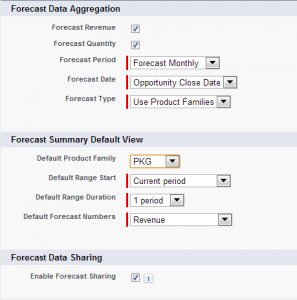 You can set up customizable forecasting to reflect how your organization forecasts its sales. With it, you can forecast on a monthly or quarterly basis, use different dates when applying amounts to forecasts, forecast based on revenue or quantity or both, and define additional quotas based on product families. Use customizable forecasts to review your forecast and drill down through your forecast amounts to see the opportunities included in your forecast. Override forecast amounts directly from the opportunity, or override the forecast from the Forecasts tab without notifying users below you in the forecast role hierarchy. Customizable forecasting is a powerful tool for your organization to use when forecasting the value of upcoming deals. Follow these steps to get started using customizable forecasting by incorporating your forecasting process into Salesforce. 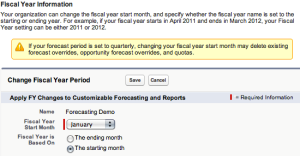 Define your fiscal year: Custom fiscal year allow you to define org. fiscal year. Set forecast settings: Here you will need to define items such as Forecast Revenue, Forecast Quantity, Forecast Period, Forecast Date, Forecast Type, Forecast Summary Default View and Forecast Data Sharing. Customize the forecast hierarchy: Forecast hierarchy is a multilevel structure of users that determines how users’ forecasts roll up through the hierarchy. It is based on the role hierarchy for your organization and should be applied to every user that uses forecasting. Enable customized forecasting: Click Your Name > Setup > Customize > Forecasts (Customizable) > Forecast Hierarchy and click Enable Customizable Forecasting to turn on customizable forecasting for your organization. Set permissions: To enable permissions in permission sets or profiles, click Your Name > Setup > Manage Users, then choose Permission Sets or Profiles. Then add the Opportunity Forecasts related list to the opportunity page layout for the appropriate user profiles. Enabling customizable forecasting for your organization allows your forecast users to view and submit their customizable forecasts from the Forecasts tab based on your customizable forecast settings. 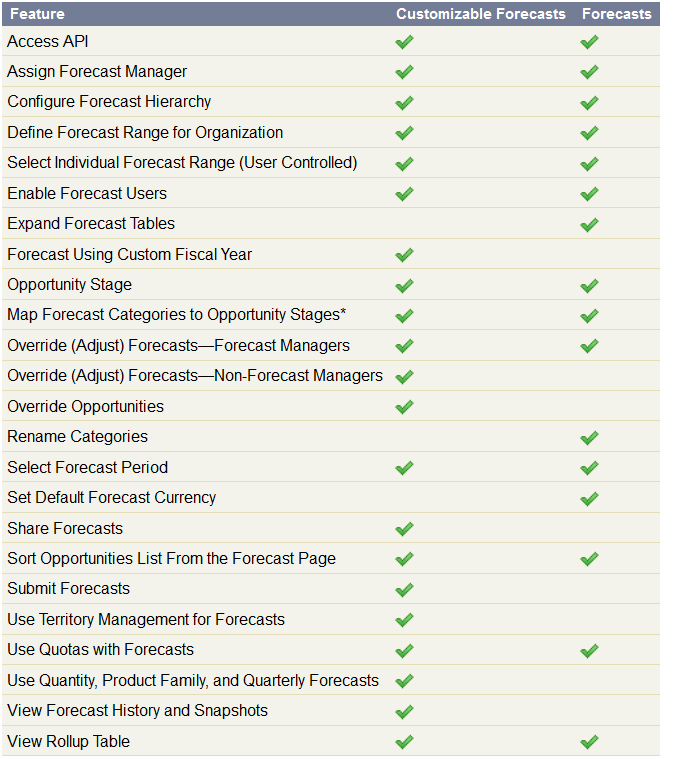 Click Your Name | Setup | Customize | Forecasts (Customizable) | Forecast Hierarchy. Allows users to override their own forecasts and forecasts for users below them in the forecast hierarchy. All standard profiles except Read Only receive this permission. Allows users to change their individual quotas. All standard profiles except Read Only receive this permission. Users with the “Manage Users” permission can always edit any quota. Users can always edit the quotas of users that report directly to them. Allows users to view any forecast regardless of their place in the forecast hierarchy. The System Administrator profile includes this permission. Define your fiscal year using standard fiscal years or custom fiscal years. Standard fiscal years follow the Gregorian calendar, but can start in any month. Custom fiscal years allow you to flexibly define a fiscal year that meets your exact needs. See the online help for more details on fiscal years. Navigate to Setup > Administration Setup > Company Profile > Fiscal Year > Standard Fiscal Year. Forecast Data Aggregation determines the type of data that is displayed on forecasts. Forecast Summary Default View determines the default product family, date start, date range, and forecast numbers for default forecasts. Forecast Data Sharing determines whether forecast data can be shared. The Forecast Revenue and Forecast Quantity checkboxes are enabled because we want both revenue amounts and quantity totals included in their forecasts. The setting of Default Forecast Numbers ensures every time a user clicks the Forecast tab that both revenue and quantity are shown at first glance. When setting up customizable Forecasting, you can set Forecasting to take either “Opportunity Close Date” or “Schedule Date” on the Forecast customization screen and Same like Forecast Type and it is based on using product families. Choose Use Product Families if you have more than one product family, and you want users to submit separate forecasts for each family. Enabling the checkbox for Forecast Sharing allows sustaining itself at the sales manager level. A second configuration needs to be set; Forecast managers can share their own forecast data, to allow Administrators to share existing forecast data and existing forecast managers to share their own views. 3. TERRITORY MANAGEMENT AND FORECASTING HIERARCHY: Territory management is an account sharing system that grants access to accounts based on the characteristics of the accounts. It enables your company to structure your Salesforce data and users the same way you structure your sales territories. Particularly if your organization has a private sharing model, you may need to grant users access to accounts based on criteria such as postal code, industry, revenue, or a custom field that is relevant to your business. You may also need to generate forecasts for these diverse categories of accounts. Territory management solves these business needs and provides a powerful solution for structuring your users, accounts, and their associated contacts, opportunities, and cases. The ability to use account criteria to expand a private sharing model. Support for complex and frequently changed sales organization structures. Support for transferring users between territories, with the option to retain opportunities. Multiple forecasts per user, based on territory membership. By default, your Forecast Hierarchy is equivalent to your Role Hierarchy (in this case, Territory based). What this means is the structure of the Role Hierarchy is exactly the same for the Forecast Hierarchy. As a matter of fact, you cannot add or remove roles from the Forecast Hierarchy screen. It has to be done in the Role Hierarchy. Share forecast manager views with other users. Each of your opportunities has a Stage picklist value that automatically maps to a Forecast Category value. The forecast category determines what column in your forecast will include the opportunity amount and if the amount contributes to your forecast at all. The values are Best Case, Closed, Commit, Omitted and Pipeline. Forecast categories cannot be renamed. Best Case includes amounts you are likely to close, closed/won opportunity amounts, and amounts in the Commit category. Closed includes amounts for closed/won opportunities. Commit includes amounts you are confident about closing and closed/won opportunity amounts. Omitted means the amount does not contribute to your forecast. Pipeline includes amounts from all open opportunities. 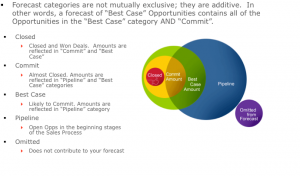 Mapping the Forecast Category with Opportunity Stages: Each value in the opportunity Stage picklist is automatically mapped to a Probability and value in the Forecast Category picklist. Change the Stage of an opportunity and the Probability as well as the Forecast Category changes with it.